** Remember to sign up for email notifications so you know when I post new entries!!! Just a few images from this past weekend’s camping trip with my wife Heidi. It’s always good to escape the mundane of civilization and go into nature to refresh and recharge. 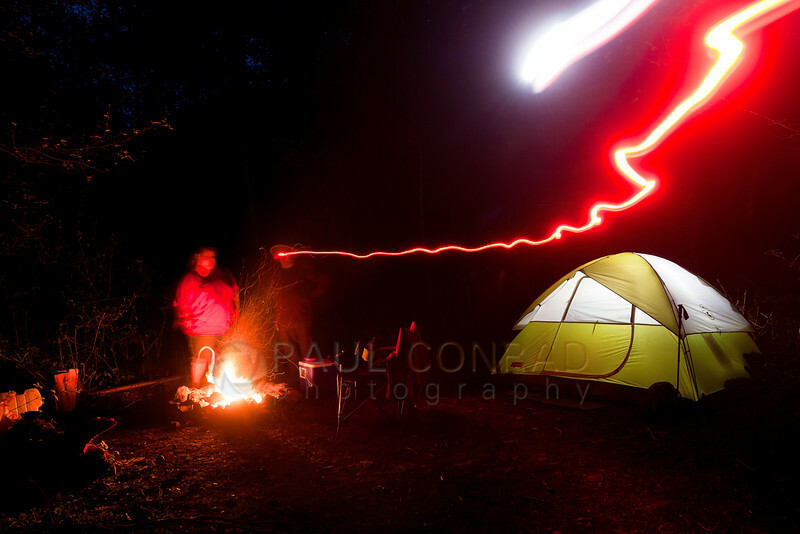 © Paul Conrad/Pablo Conrad Photography – Long exposure using a headlamp against a translucent Nalgene bottle to light the tent and my headlamp as I walk to take another photo. The one thing I like about nature or landscape photography is that I have to slow down. I shoot a lot of sports, weddings, and news, so putting my camera on a tripod is a great break from handholding my gear. 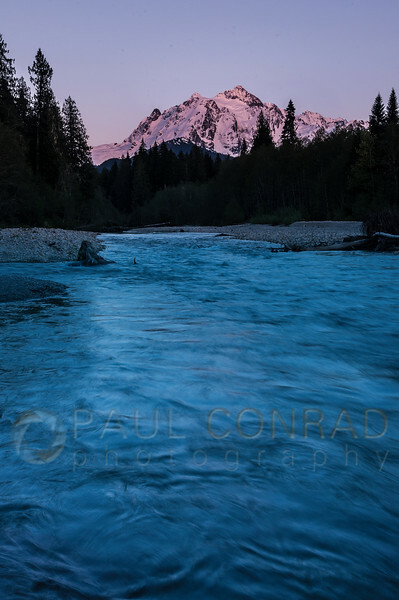 © Paul Conrad/Pablo Conrad Photography – The setting Sun lights Mount Shuksan in alpenglow. As I was scouting a place, I wanted the river leading to the mountain, I found a great angle but had to climb down the rocky embankment to get to the spot. On my way down, I saw an egg with writing on it and took a few photos (see next photo). Once I was at my spot, I realized I had about an hour until sunset. So I set up my camera and shot about 150 frames of time lapse. Unfortunately, I forgot my ND filters so I couldn’t get a slow enough shutter speed to get the water flowing. I like having to stop and think about composition, time, moment, color, and flow. Especially the flow of water. And trying new techniques. You can’t really fail if you don’t try. 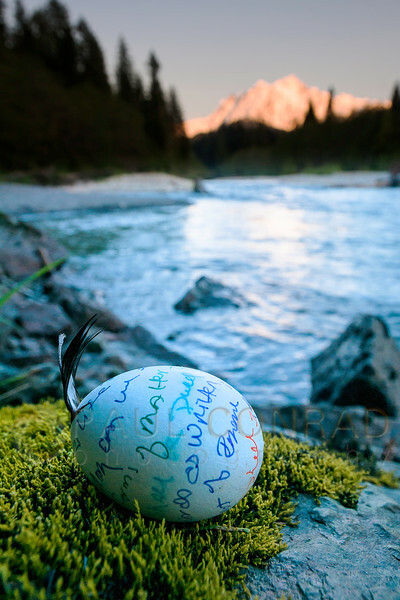 © Paul Conrad/Pablo Conrad Photography – An egg used for a memorial or Moon light ceremony sits on a mossy rock along the North Fork of the Nooksack River in Whatcom County, Wash., near Mount Baker in the Mt. Baker-Snoqualmie National Forest along Hannegan Pass Road. Above: While climbing down to the river, I saw this egg sitting on a patch of moss next to the river. I thought it weird that someone would leave an empty eggshell, with writing and feathers sticking out of it, along the river. So I radioed my wife and she said it may be from a moon ceremony or other memorial. So I took a few photos of it with Shuksan in the background and left it alone. It’s the little discoveries that make hiking and landscape photography so much fun. What I really enjoy about landscape photography is the quiet and solitude. It gives me a chance to reflect on things and helps formulate what’s going on. It centers me. 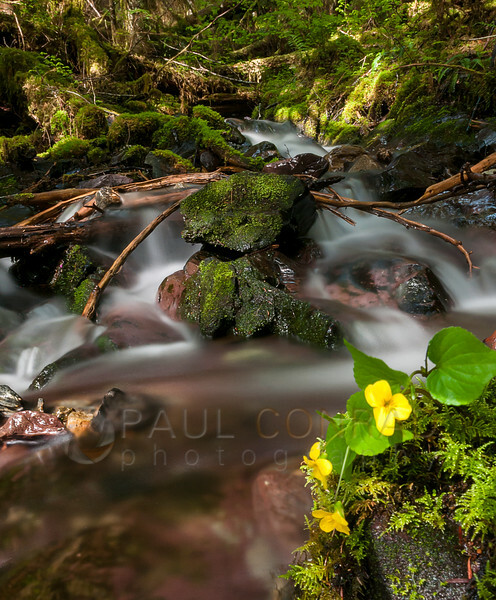 © Paul Conrad/Pablo Conrad Photography – Yellow flowers in a stream along Hannegan Pass Road near Mount Baker in the Mt. Baker-Snoqualmie National Forest in western Washington. During Saturday, I hiked up Hannegan Pass road about a mile and a half. I saw a wide stream I wanted to shoot the day earlier. It was wide and somewhat rocky. When I arrived, I noticed little yellow flowers growing out of a rock in the middle of the stream. To get the angle I wanted, I had to turn the center column of my Vanguard Abeo Plus 323CT carbon fiber tripod and had my camera upside down about 4 inches from the running stream. The Big Dipper was directly overhead and we had a clear view of it. I liked how the campfire lit the trees to add depth. 1-35 f/2.8 lens set at 2.8, ISO 200, WB set to “sunny,” and 30 second shutter. In Lightroom, I desaturated the orange and yellows in the trees to make the yellow/blue contrast less of an issue. Also, feel free to share and reblog, link to, and add your site in the comment section. Sign up for updates so you don’t miss on other postings. 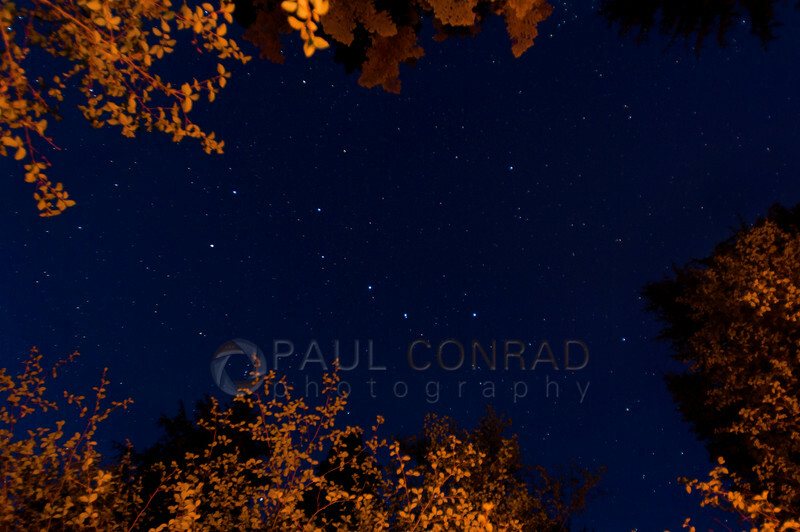 Paul Conrad is an award-winning, nationally and internationally published freelance photographer living in Bellingham, Whatcom County, Wash., north of Seattle in the Pacific Northwest. His work has been published in newspapers and magazine throughout the United States and in Europe. His clients include Getty Images, Wire Image, The Bellingham Herald, and many local business in Whatcom County. Previous clients are Associated Press, the New York Times, L.A. Times, Denver Post, Rocky Mountain News, and many others. His specialty is photojournalism covering news, sports, and editorial portraits, he also is skilled in family portraiture, high school senior portraits, and weddings. He is available for assignments anywhere in the Pacific Northwest.